With silica stems and carbonate cones and corals all in a row. 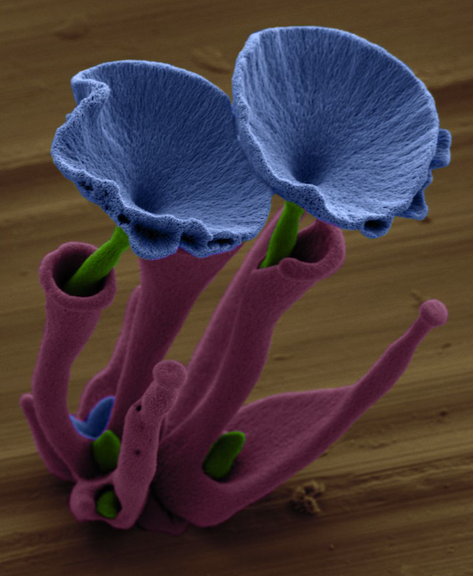 False-color electron micrograph* of a barium carbonate/silica ‘flower’ standing approximately 100 micrometers tall (courtesy of Wim Noorduin). 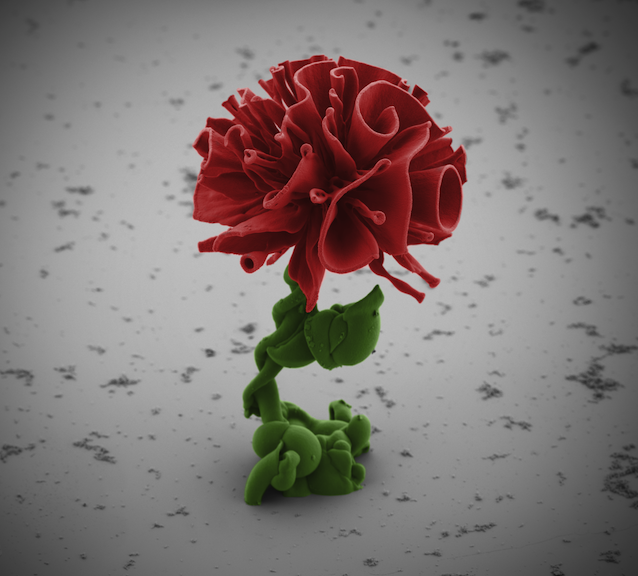 How do you sculpt a flower so small that even a honey-bee would never see it? There are ways to be sure, but they are either expensive or crude, and the complexity of a life-sized flower is still nearly impossible to mimic on a very small scale. That may be about to change. In the cover article of tomorrow’s Science magazine, engineers in the laboratory of Joanna Aizenberg at Harvard University demonstrate that they can control the emergence of intricate structures standing less than one-tenth of a millimeter high. They can alter the pH mid-growth to create helical stalks topped by blooms of corals and cones. Or, by controlling the influx of CO2, they can use the thickening and thinning of a structure’s walls to write messages in Morse code. They can make stems in vases topped by cones and coral blossoms, or corals with spiral arms that intertwine with their neighbors. 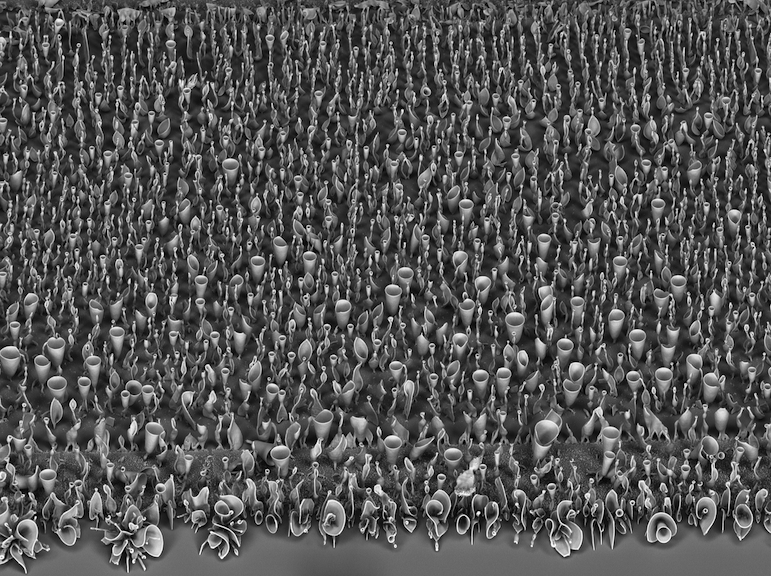 Electron micrograph of field of barium carbonate/silica stems, cones, and corals (courtesy of Wim Noorduin). False-color electron micrograph of a strontium carbonate/silica ‘flower’ grown inside a barium carbonate and silica ‘vase’. The vase is grown first, the stem then nucleates and crystallizes from inside of it. A burst of CO2 causes the flower to ‘bloom’ (courtesy of Wim Noorduin). Abraham Lincoln observes sculptures assembled on on the steps of the Lincoln Memorial–the Lincoln Memorial on the back of a penny, that is (courtesy of Wim Noorduin). A field of barium carbonate/silica cones whose walls are thinned and thickened by alternating bursts of CO2 (courtesy of Wim Noorduin). 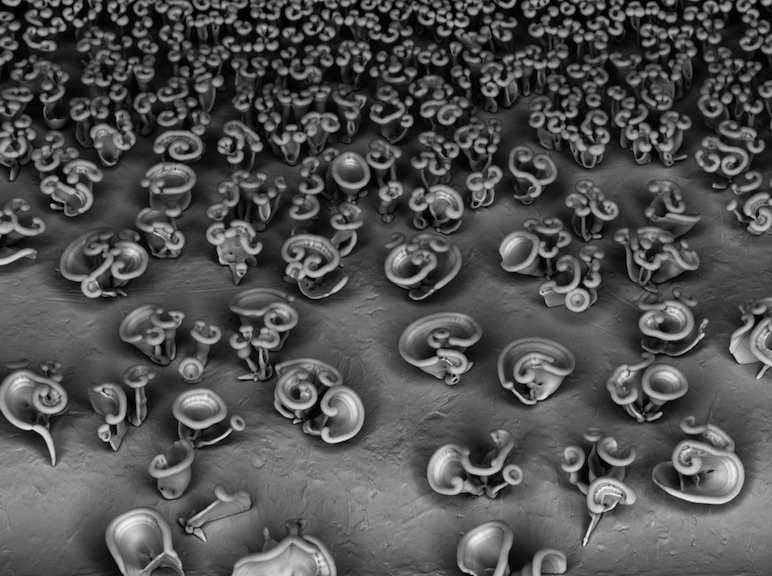 *These structures are so small that the only way to see them in detail is using an electron microscope. †Their method works because as the metal carbonate crystallizes, the chemistry of the solution just around the edges of the crystal changes ever so slightly. This tiny change is just enough to set off the co-precipitation of the silica. 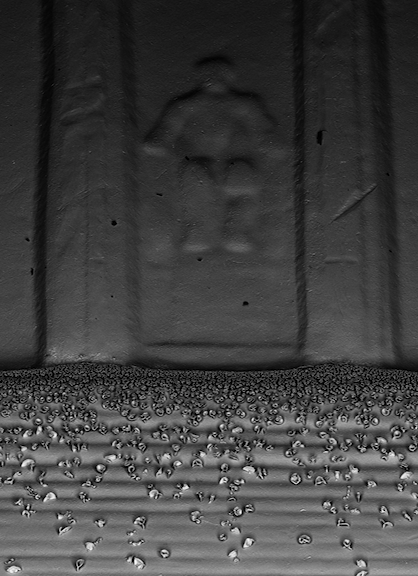 Anywhere the silica grows, the metal carbonate crystal is stopped in its tracks. This means that the metal carbonate is in a race against time to grow away from the areas where the chemistry is right for silica crystallization. §And what causes the different structure-types? At one pH (dubbed “the blossoming regime” by the authors), depending on how many neighbors it has, the sculpture will propagate in a straight line (creating stems), fan out from the original crystal (creating cones), or grow randomly in three dimensions (creating corals). At another (“the curling regime”), growing in on itself is the quickest way for a sculpture to escape the suffocating silica sheath. And so, it wraps around itself, around its nearest neighbor, or sticks close to the surface, creating single and double helices and flat planes.